Microsoft has launched a new website YourBrowserMatters.org to show you how your browser helps keep you secure online. The site provides you with resources to improve your online security and increase protection from socially engineered malware threats like phishing attacks. The website provides data for Internet Explorer, Chrome and Firefox. Scores range on a scale of 0 to 4, and they are calculated using data from the Security Intelligence Report as well as what experts such as the Anti-Phishing League, Identity Theft Council, and Online Trust Alliance believe to be the most important aspects of browser security. When I visited the site in Opera I got the message: We can’t give you a score for your browser. Internet Explorer gets a 4, Chrome gets 2.5 and Firefox a 2. The testing methodology has also been described there. 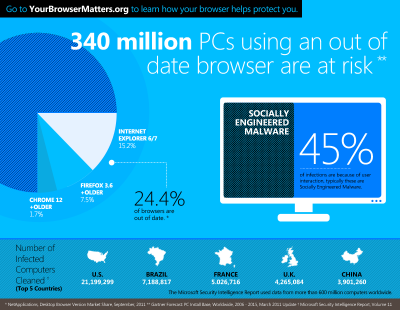 Microsoft says that 24.4% of the PCs in the world connected to the Internet use an outdated version of the browser. This works out to 340 million PCs. 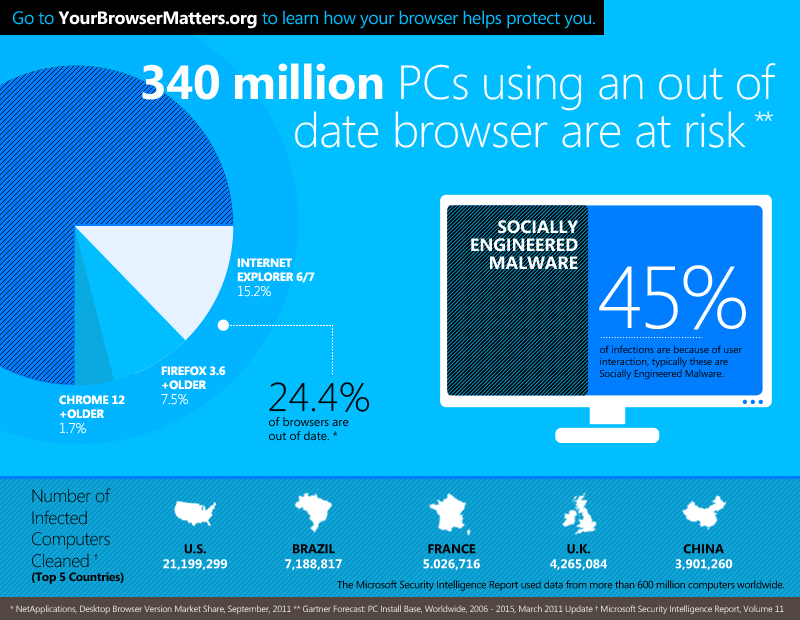 See how your browser stacks up at YourBrowserMatters.org. Microsoft astroturfing. Ironic how the page requires the use of flash when flash is the predominant vector for web based malware. Another MS biased security test…big surprise. I improved my Firefox rating to a 4/4; the same as IE9. You just have to change the UserAgent string sent by Firefox to match that of IE9. 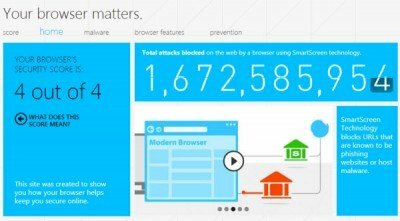 Pretty nice to have a secure browser without all of the fuss.